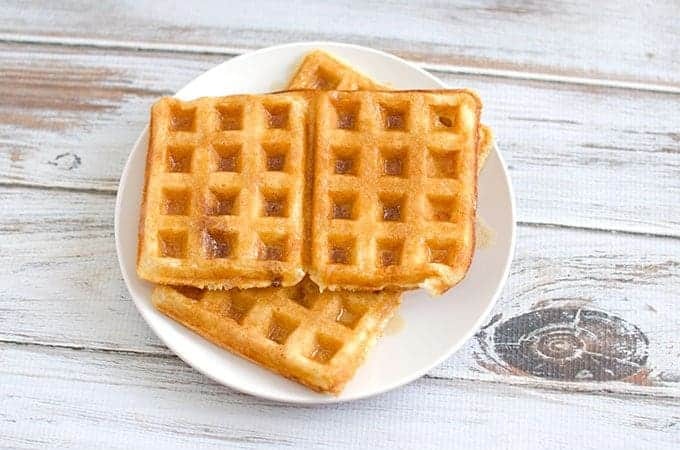 You’ll love waking up to this overnight yeasted waffles recipe being almost ready to go! Some of the links in this post are affiliate links. I’m so not a breakfast person during the week. Yes, I may eat during breakfast hours, but for some reason I prefer lunch and dinner foods. When it comes to the weekend, though, I love taking the time to make a late morning brunch. Sometimes it’s biscuits and gravy, sometimes it’s frittata, other times it’s pancakes. Lately, however, I’ve been on quite the waffles kick. I’ve always loved waffles, and was in heaven when I discovered you can buy waffle iron plates for the Cuisinart Griddler a couple years ago. About every other weekend I’d wake up and make a quick waffle batter that was similar to pancake batter. And, it was great, we both enjoyed the fluffy, buttery taste. But, I was left longing for waffles that were crisp on the outside with a nice fluffy inside. I knew that you could achieve this with yeasted waffles, but I didn’t really want to wait a couple hours on breakfast when we usually sleep in on the weekends anyway. So, I did a little digging and was delighted to see that you can make awesome waffles from an overnight yeasted waffles recipe! 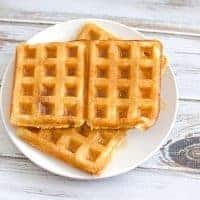 This homemade waffles recipe is actually quite easy and doesn’t take much time at all to put together, even on a late Friday night. The resulting waffles are delicious vehicles for a drizzle of melted butter and maple syrup with their crisp exterior and fluffy center. I also like to add a dollop of homemade whipped cream and a handful of fresh blackberries or strawberries. Plus, I like that the waffles stay crisp for some time if you feel like going back for seconds. It’s the weekend after all, right? Recommended Equipment: Waffle maker, microwaveable glass measuring cup, whisk, and large turner. You'll love waking up to this overnight yeasted waffles recipe being almost ready to go. Pour warm water into a large bowl and sprinkle yeast over the top. Whisk yeast into the water until it's mostly dissolved. In a 4-cup microwavable cup or bowl, place milk, butter, salt and sugar. Microwave for 1 - 2 minutes, depending on your microwave, until warm and butter has melted. Stir to dissolve salt and sugar. If the mixture is hotter than 115°F, you'll need to let it cool. You can also do this in a small saucepan on the stove if you prefer. At this point, you should see small bubbles in your water/yeast mixture. If you don't, you may have killed your yeast and need to start over, or your yeast is too old and you need fresh. Add flour and milk/butter mixture to the yeast mixture. Whisk or beat with a hand mixer until thoroughly combined and smooth. You don't have to worry about over-mixing like with pancakes. Cover the bowl with plastic wrap or a clean towel and leave at room temperature overnight. The mixture will double or more depending on how long it sits. The next morning, preheat your waffle iron. Since each iron is different, you may need to play with the temperature setting, but I suggest medium-high. I use 400°F for the Cuisinart Griddler. When ready to make the waffles, slightly beat eggs in a small bowl, then add to the waffle batter along with the vanilla and baking soda. Mix until batter is well combined. It will be thin. I do not grease the non-stick waffle plates and have no issue with them sticking. 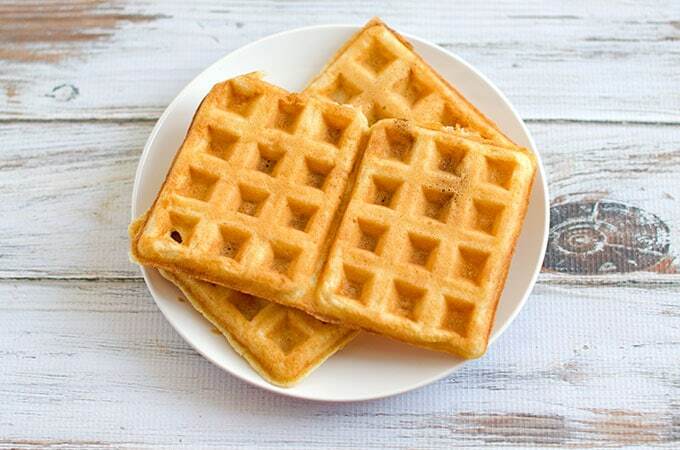 Place enough batter into your waffle maker to cover the mold, but not enough to overflow. This will vary by waffle maker. Cook the waffles until they are golden brown and crispy. I usually gauge by when there is no longer steam coming out of the waffle maker. Keep warm in the oven in a single layer (so they stay crisp) at the warm setting or 200°F until ready to serve. Top as desired with toppings like maple syrup, butter, whipped cream, preserves and/or berries. What are your favorite toppings for this Overnight Yeasted Waffles Recipe?